Are you ready to make some Harry Potter spells? One of our favorite parts of visiting Wizarding World of Harry Potter is the interactive wand spell locations. My kids love this part of the experience. You become a wizard! 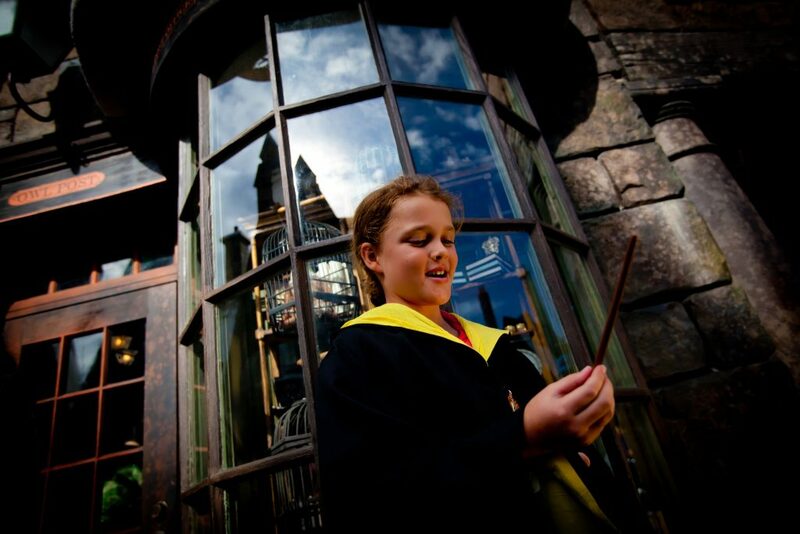 You can purchase an interactive wand to perform Harry Potter spells from numerous locations throughout Universal Orlando Resort, including CityWalk and Universal Orlando Hotels. Inside the interactive wand box, you will get a map of all of the wand spots. We wanted to take it a step further and create a Harry Potter Spells Guide to help you navigate these spell locations. The following Harry Potter Spells Guide will take you through the spells that you can perform with special interactive wands at the Wizarding World of Harry Potter – Diagon Alley™ and the Wizarding World of Harry Potter – Hogsmeade™. Let’s start at Diagon Alley™ which is my favorite park. This newer area of Wizarding World of Harry Potter has some of the best interactive wand spell locations. Throughout Diagon Alley™, you will find 16 interactive wand spell locations. 11 in the greater Diagon Alley™ area and 5 in Knockturn Alley. Hogsmeade™ has 9 interactive spell locations. 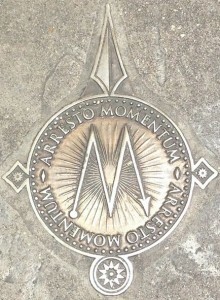 The interactive spells are marked with a brass medallion embedded in the ground. Below, you can find the locations, Harry Potter spells, and the effects produced. #2 Location: Flimflams Lanterns Spell: Incendio This spell lights the lanterns at Flimflams Lanterns. #3 Location: Umbrella Sign Spell: Metelojinx Make it rain! #4 Location: Magical Menagerie Spell: Silencio Causes a creature to stop chirping. #5 Location: Wiseacres Wizarding Equipment Spell: Dark Detectors This one’s really kind of boring. Wave your wand a bit and eyes open up in the window. Maybe. #6 Location: Wiseacres Wizarding Equipment Spell: Specialis Revelio This one is pretty cool. It reveals an archer on a star map. He fires an arrow and his dog retrieves it. #7 Location: Scribbulus Spell: Wingardium Leviosa Levitates a quill above a parchment. #8 Location: Bowman E. Wright Blacksmith Spell: Reparo Repairs a suit of armor. #9 Location: Bowman E. Wright Blacksmith Spell: Locomotor Bellows Works a bellows to stock the blacksmith’s fire. #10 Location: Mermaid Fountain Spell: Aquamenti Creates a stream of water from the fountain. The fun part? Where is the water going to hit?? #11 Location: Weasley’s Wizard Wheezes Spell: Descendo Flushes a plunger down a toilet! #1 Location: Chimney Sweep Elf Sign Spell: Locomotor Chimney Sweep This one may be a bit tough to spot. You have to look up! You’re looking for a red sign in the shape of a chimney. The spell causes a little chimney sweep to climb the chimney. #2 Location: Dystal Phaelanges Spell: Moving Skeleton One of the most popular spells in the new park. Your body motions will be mirrored by the skeleton in Phaelanges’ window. #3 Location: Noggin and Bonce Spell: Mimblewimble Silences the talking heads in the window. #4 Location: Tallow and Hemp Toxic Tapers Spell: Incendio Has various effects on the bird in the cage. #5 Location: Trackleshanks Locksmith Spell: Alohomora This one might give you a scare! A gust of wind is the effect. The original park inside Wizarding World of Harry Potter is Hogsmeade. This quaint area still has some fun Harry Potter spell locations. There are not as many at Diagon Alley, but still tons of fun for the kids. #1 Location: Zonko’s Joke Shop Spell: Incendio Sets off spinning wheels and rockets. #2 Location: McHavelock’s Spell: Arresto Momentum Stops water from pouring into a cauldron. #3 Location: Honeydukes Spell: Revelio Opens a chocolate frog box to reveal the frog. #4 Location: Dogweed and Deathcap Spell: Herbivicus Watch the plant in the window. The leaves will turn green. #5 Location: Gladbags Wizardwear Spells: Ascendio and Descendio Raises and lowers a measuring tape on the robe in the window. #6 Location: Madam Puddifoots Spell: Locomotor Snowman Moves the snowman cake topper. #7 Location: Dervish and Banges Spells: Locomotor and Arresto Momentum Starts and stops the music box in the window. 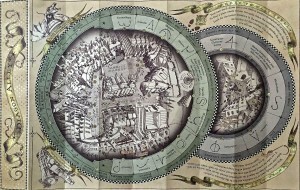 #8 Location: Tomes and Scrolls Spell: Alohomora Opens/Unlocks a copy of Tales of Beedle the Bard. #9 Location: Spintwitches Spell: Wingardium Leviosa Causes the Quidditch balls on display to levitate. TIP: There are some “hidden” spell locations! They do not have medallions marking the locations of these Harry Potter spells. Be sure to ask around to see if you can find some of them. I’ll give you your first one, it’s at Scribbulus in the second window. We share all of these spell locations in our video guide to Harry Potter spell locations at Wizarding World of Harry Potter. You can see these spells in action. We share each spell and what happens after you create the spell. 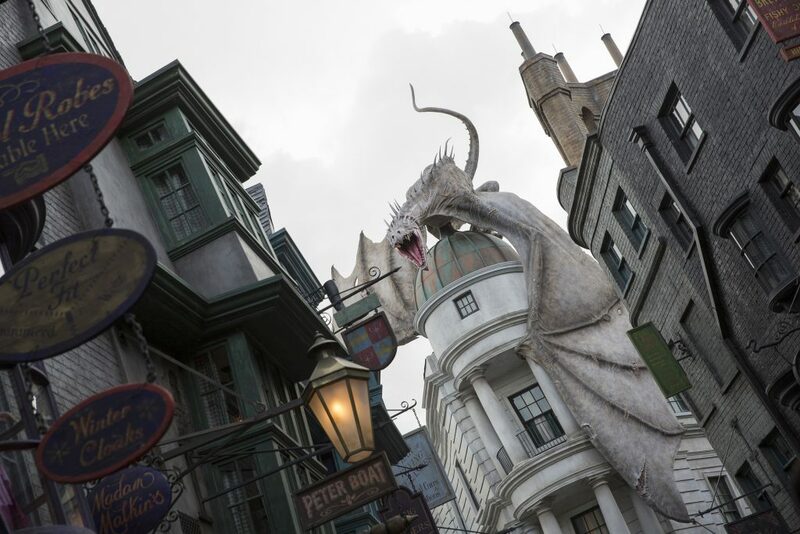 Do you have a favorite interactive spell location at Wizarding World of Harry Potter?